As you may know, cache memory is a block of solid-state memory that sits between the hard drive and system memory. When data is requested from the hard drive, a larger block of data than requested is moved to the cache because odds are further requests for data will be from the same block, and cache memory is much faster than the hard drive. This improves performance. 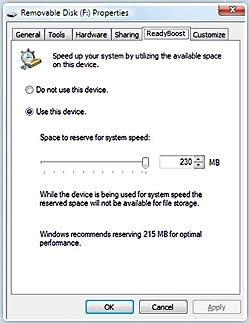 ReadyBoost is a feature of Windows 7 that allows you to use a USB flash drive or a secure digital (SD) memory card as cache memory. You don't have much to do to set up ReadyBoost. Just plug in a removable memory device that meets the ReadyBoost performance requirement. Not all flash drives and SD cards meet the performance requirement, some are actually quite slow. When a removable memory device is first inserted, Windows checks to see if its performance is fast enough to work with ReadyBoost. If meets the performance requirement you're asked if you want to use the device to speed up system performance. You can choose to allocate a portion of the devices memory to speed up performance and use the remainder to store files. A newer PC has many levels of cache memory, including cache memory built-into the processor and built-into the hard drive. Normally, a portion of system memory is also used as cache memory. So if you have a newer PC with plenty of memory, ReadyBoost won't significantly improve performance. Even with an older PC, an upgrade to increase the size or speed of memory will improve performance more then ReadyBoost. But if you have an older PC in which you don't want to invest for a memory upgrade, you can improve its performance with ReadyBoost.